Jim Daley, Chris Dale, Quentin Archer, Dominic Jaar and Patrick Burke. CEIC attracts attendees from organizations operating around the world, so there was strong interest in the panel on “International E-Discovery: Data Protection, Privacy and Cross-Border Issues.” The panel featured Quentin Archer from Hogan Lovells International LLC’s London office, M. James Daley of Daley & Fey (US), Dominic Jaar of KPMG-Canada, Chris Dale of the eDisclosure Information Project (UK) and moderated by Patrick Burke of Guidance Software. 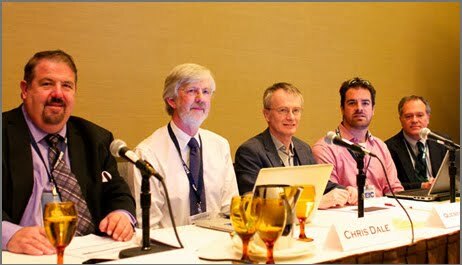 Both Quentin Archer and Jim Daley are immediate past Chairs of the Sedona Conference Working Group 6 on International Electronic Information Management, Discovery and Disclosure. The discussion began with an explanation of the various approaches to discovery in jurisdictions around the world, and how those different approaches to discovery influence attitudes and resentments among lawyers and courts in jurisdictions with diametrically different approaches. Chris Dale likened these differences in perception to the different views of D-Day, one the Allied view of storming a fortified beach, the other the Axis view of being invaded from the sea. Dominic Jaar asked how US parties would feel if they received what they considered an overbroad and invasive document request – from a court in China? Jim Daley then kicked off an in-depth explanation of European data privacy restrictions and their impact on US e-discovery efforts that include collection of data from European employees, and the frustrations and challenges that ensue. Chris Dale quoted Browning Marean on the growing friction between US e-discovery and European data protection: “There’s going to be a trainwreck.” Quentin Archer carried the analysis further to the proposals currently being considered by European data protection officials, in some ways that will ease tensions, and others that may well not. The panel concluded with Dominic Jaar sharing his experience on international e-discovery challenges including everything from language and translation issues to the physical and legal challenges of transporting collected data out of certain countries. The audience, consisting largely of representatives of companies and organizations that operate globally, took in a lot of valuable expert information both on the law and practicalities of conducting international e-discovery. A pdf copy of the powerpoint used by the panel can be found here.